The Video Pro’s Best Friend, a unique conductive copolymer coating for sensitive electronics that offers more protection and flexibility than a simple contact cleaner. Specially formulated for remote and exposed environments with added protection against extreme heat, cold, moisture (hydrophobic) and humidity. Restores, conditions and protects video electronic gear, lighting, cameras, audio and video cables, microphones, power distribution boxes and cables, etc. The sophisticated gear used in creating video includes cameras, mixing consoles, video editors, microphones, and much more, making amazing things possible – yet all these hi-tech wonders are vulnerable to damage from moisture and humidity, oxidation build-up, heat, and friction that occurs over time, increasing the likelihood of technical difficulties including drop-outs and distortion. LECTRICare is a conditioning and lubricant formula that transforms the critical area of gear maintenance to prevent excess wear and contamination. LECTRICare’s micro-barrier technology optimizes the surface contact of metal components including jacks, plugs, switches, etc. to ensure that drop-outs, static, or interference won’t jeopardize your projects. 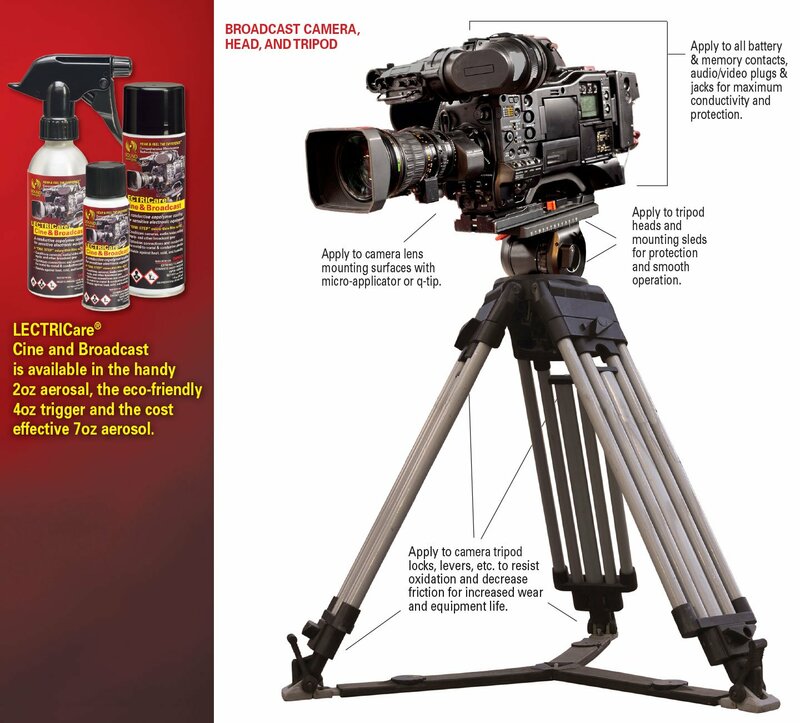 Formulated especially for the demands of a wide range of electronics technology, LECTRICare® Cine & Broadcast is the result of research into micro-lubricants for demanding ballistics applications. Unequaled in its ability to penetrate and lift away deeply embedded grime and tiny debris particles, LECTRICare ensures that the signal path remains clear and error-free. A micro-thin barrier lubricant coating remains after treatment to resist heat and oxides, promote enhanced electrical conductivity, and to protect and extend the life of sensitive electronics. Recommended application is with a soft lint-free cloth. Includes an application tube to apply to difficult to reach areas. LECTRICare quickly dries to the touch for immediate use. Available in three sizes for shop, sound studio, or the road.